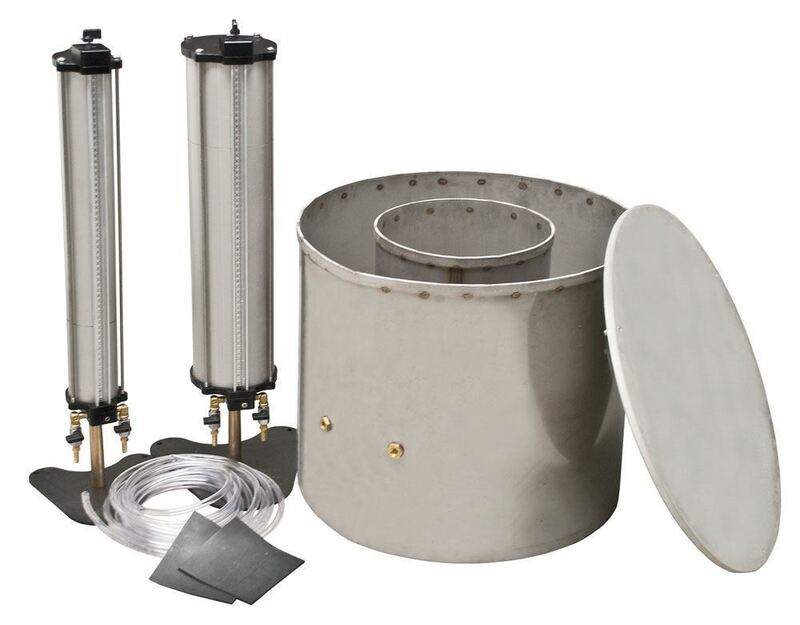 Double Ring Infiltrometer Field Equipment - Gilson Co.
HM-128 Double Ring Infiltrometer is used in the field for measuring the rate of infiltration of a liquid, generally water, into fine or coarse-grained soil in accordance with ASTM D3385. Determining the infiltration rate of liquids in soil provides useful data for geotechnical and environmental studies. It also helps determine a soil’s potential for leaching, leakage, irrigation and drainage. This method of testing is especially applicable with fine-grained soils that offer minimal resistance when the rings penetrate the soil. The infiltrometer consists of an inner and outer galvanized steel ring and a driving cap with centering pins. The inner ring is 12x20in (305x508mm) and the outer ring is 24x20in (610x508mm) Dia.xH. The rings have a reinforced double-thick top edge and beveled bottom for easy driving of the infiltrometer into the soil. The driving cap is .50in (12.7mm) thick and constructed of hard alloy aluminum. Also included are a 3,000ml and a 10,000ml graduated calibrated constant-head Mariotte Tube that serve as a water reservoir. The tubes come with support stands, rubber splash guards and 30ft of 3/8in (9.5mm) ID clear vinyl tubing. The aluminum tube is marked with divisions in millilmeters to indicate water flow using the acrylic sight on the outside of the Mariotte tube. The rings are filled with water and the water level maintained by the Mariotte Tubes. The tubes provide and maintain a constant head of water for the test. Water between the two rings allows for one-dimensional vertical flow beneath the inner ring. The velocity of liquid passing to the soil from the inner ring is equivalent to the infiltration rate. An optional HMA-635 Infiltrometer Field Set, sold separately, includes the essential tools to set-up and run the test. Replacement Mariotte Tubes are also sold separately.